Perfect for the weekend. Or a beautiful breakfast any day. When you have a little extra time to breathe…. 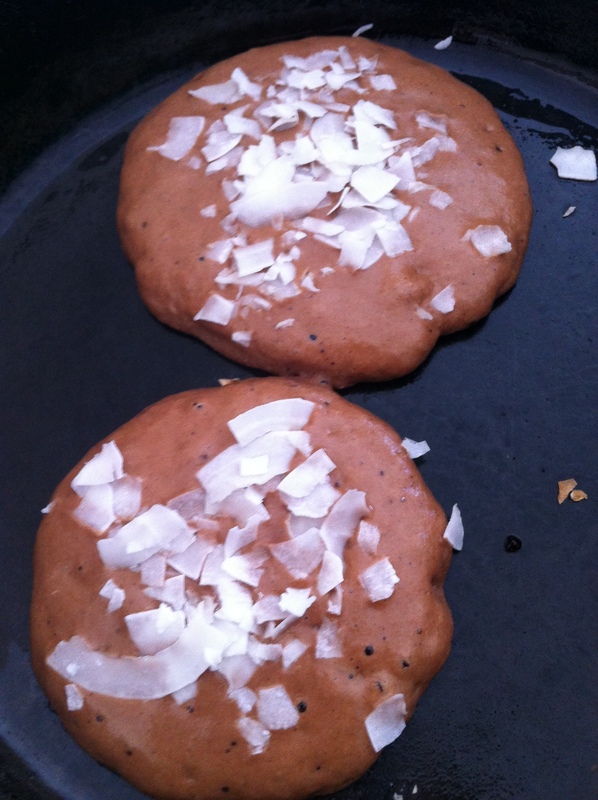 These light, gluten free pancakes have a delicious quadruple dose of coconut: coconut flour – a high fiber, tender addition to the batter, coconut milk – luscious and pure, creamy coconut oil, plus flaked organic coconut scattered over the top of each pancake before you flip and cook on the second side. Coconut every way. And organic cocoa powder. 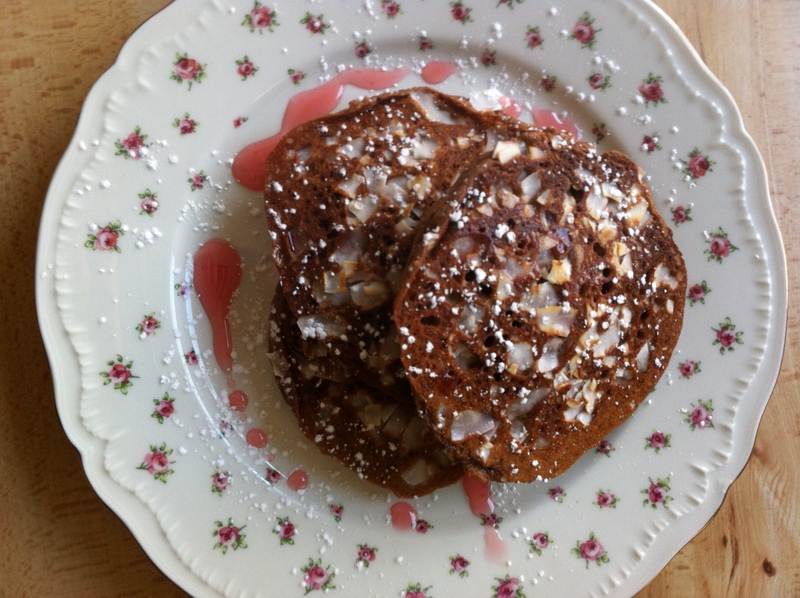 The coconut lightly toasts when you flip the pancakes, and smells sooo fragrant. With maybe a few drops of warmed chocolate ganache? But they are lovely, absolutely, with a dusting of powdered sugar and a touch of honey. 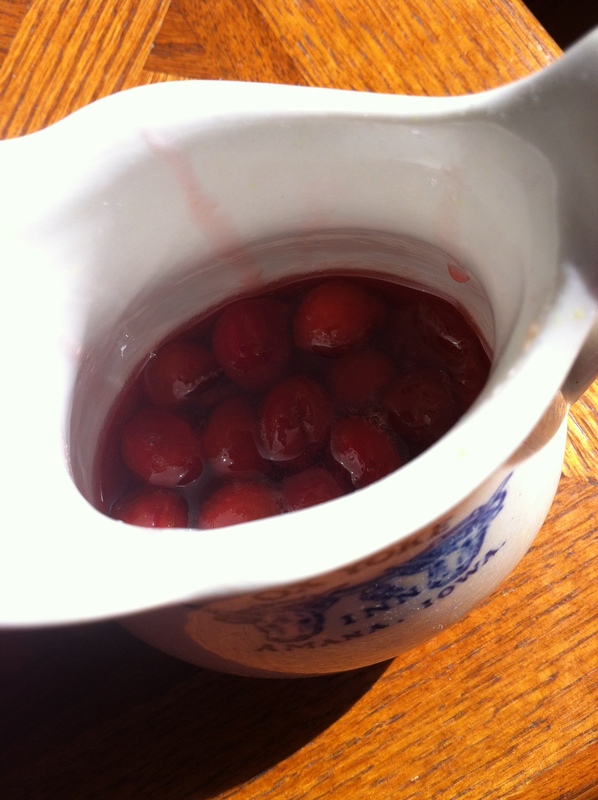 I steeped and simmered some local honey with a handful of my sour cherries …. you know how I love them! The color is rosy and what a flavor. 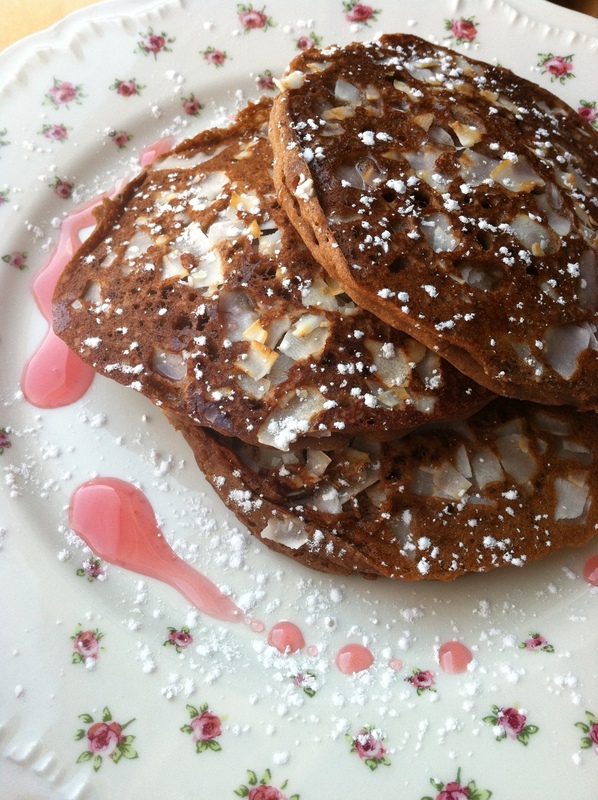 Use just a little, so the light textures of the pancakes shine through. If you don’t have sour cherries on hand, seek out either dried cherries, or a nice sour cherry jam. Assemble and whisk together dry ingredients. Oil and heat cast iron or other non-stick skillet over medium low heat. Whisk liquid ingredients into the dry, making a pourable chocolate batter. Pour batter into skillet, forming small pancakes about 3 inches across. 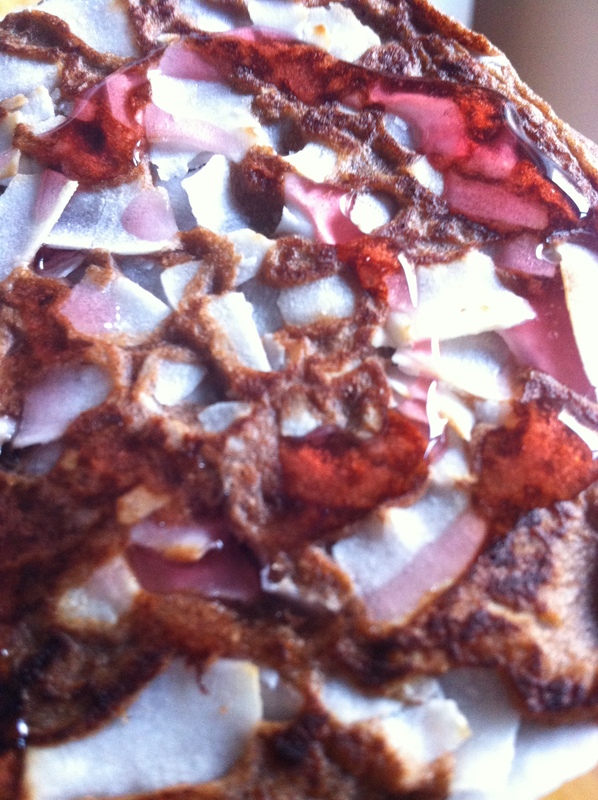 Scatter the top of each pancake with about one tablespoon of dried coconut. When large bubbles form around edges, gently flip with a thin, wide spatula, and cook a couple of minutes more. Keep warm until all of your pancakes are made. 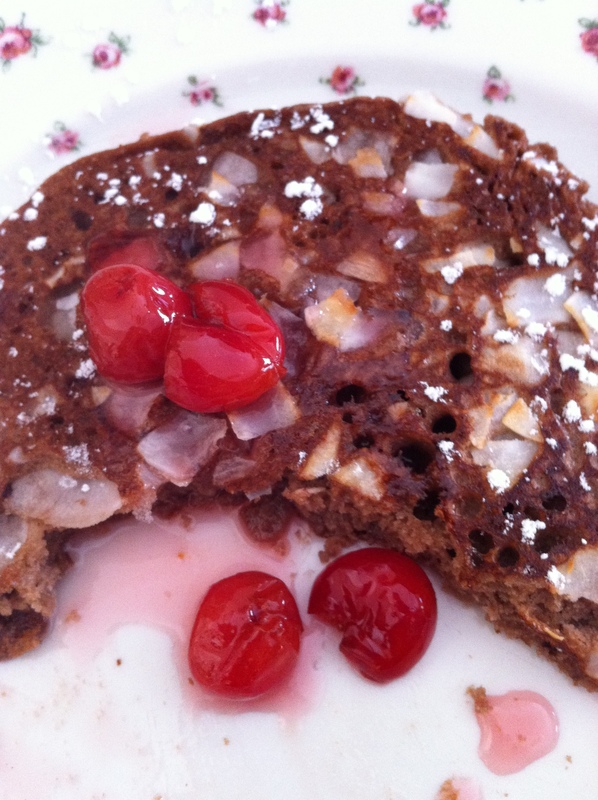 Serve with a dusting of powdered sugar and “cherry honey”, or with your favorite toppings. Simmer together for 5 or 6 minutes, and let cool slightly before using. have a beautiful, chocolate coconutty day! Have a beautiful, chocolate, coconutty day! Blessings. 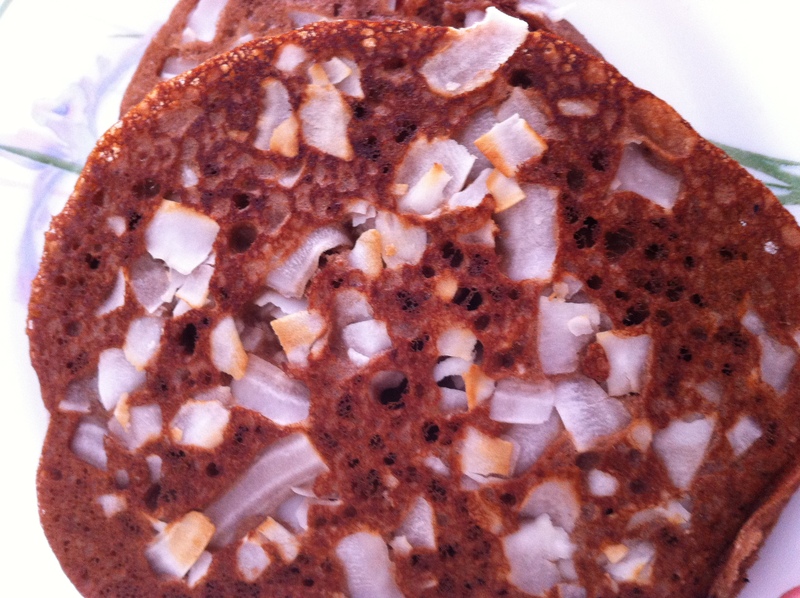 Lovely recipe Margaret using two of my favorite ingredients; chocolate and coconut. I can’t wait to try them! Thank you so much, Jan! Please let me know how you liked them! — By the way, these are two of MY favorite ingredients, too, and quite wonderful wherever they are together!